Do you want a way to greet guests while also creeping them out? Do you want everyone from your mail carrier to your mother-in-law to know that you're deep in the spirit of the season? It's a good idea. Cause people should know where you're coming from. They should know that while you're usually open to recommendations when it comes to your October tastes, you crave only scary movies, moody music, and super scary books. Come on! How can you walk away from all this delicious doom and gloom? The leaves are crunchy and the wind is howling. This time is precious and only lasts about thirty days. Get ahead of the curve and let your visitors know just who's door they're knocking on! The beautiful wreath is based with black tinsel but it also has tiny silver skulls scattered throughout to add a little spark of joy. 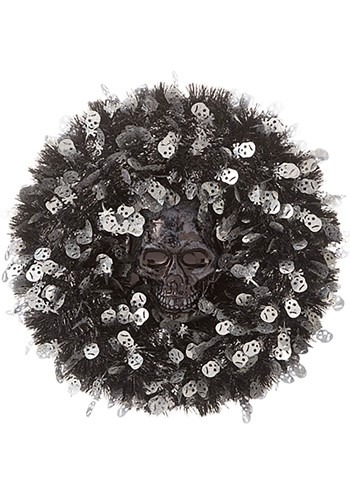 The wreath is centered with a molded black skull so people will pick up on what you're putting up as soon as they see this gorgeous wreath. Have you ever realized that skeletons have beautiful smiles? Maybe it's just that they don't have any lips but we find those toothy smiles rather charming. With plenty of skeletons, You'll have everything you need to turn your home into the horror house of your dreams!